Noosa is one of Australia’s favourite holiday destinations. It has something for everyone – gorgeous beaches, plenty of outdoor activities, shopping, places to pamper yourself, and above all – amazing luxury accommodation. Now, naturally, not everyone can afford a Noosa luxury holiday. However, if you’ve got the money to spare and feel like spoiling yourself, there are plenty of outstanding luxury accommodation options available, suiting a wide range of budgets. We’ve put together a small selection here to give you a taste of what’s available. Keep in mind, these are some of the pricier luxury accommodation options available on our books. If you’d like to broaden your net and find some hidden gems elsewhere, search through all of our Noosa accommodation. Price: From $1,290 per night. Located on Witta Circle, a hub of premium Noosa luxury accommodation, 25 Witta Circle is one of the finest offerings we have available. 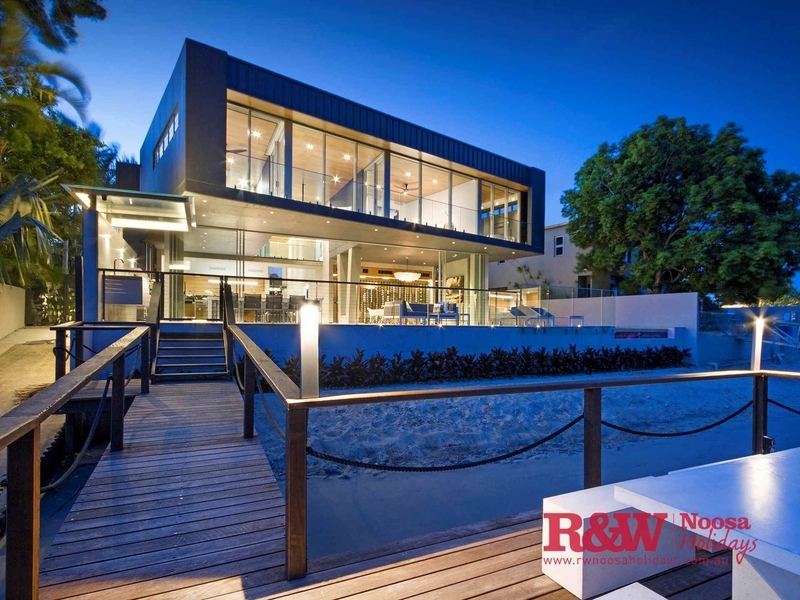 Last sold in 2014 for an eye-watering $6,500,000, 25 Witta Circle redefines luxury accommodation. Architecturally designed for comfort and elegance, a few nights here is an experience you won’t soon forget. Price: From $1,371 per night. One of Noosa’s most beautiful waterfront accommodation offerings, 12 Noosa Parade puts you right over Noosa Sound. Wake up to a sunrise over the water, birds in the trees nearby and a brackish breeze coming off the sound. Enjoy your morning coffee on the dock, soaking up the atmosphere and preparing for the day ahead. With all the bells and whistles, this is what a Noosa luxury holiday is all about. It has everything you’ll need to spend the weekend and extreme luxury. Price: From $1,239 per night. Premium beachfront accommodation doesn’t get much better than this. Your front door opens right onto Noosa main beach (just past the pool and amazing outdoor area). This is as central as it gets, with Hastings Street just a stone’s throw away. It’s the little things that make a Noosa luxury holiday stand out from the rest, and this holiday apartment has them in spades. Whether you’re a morning person or an evening person, you’re going to love the sun over the water right out your front door. This is one of the most prestigious holiday accommodation options in Noosa, and is thoroughly equipped for the holiday of a lifetime. Price: From $1,190 per night. In Brief: 3 Bedrooms, 3 Bathrooms, Sleeps 6. Direct ocean views, hard granite countertops in a large kitchen, and all the amenities you need to live large for a weekend – this is one of Noosa’s best luxury holiday destinations. Your own stretch of lawn this close to the beach is a rare feature for any beachfront apartment. Accompanied by a patio area that is perfect for barbecues and you’re set for plenty of nights outside enjoying dinner and the sunset. Price: From $2,500 per night. If you insist on nothing but the best, this is the place for you. This penthouse represents the top tier of Noosa luxury accommodation. High ceilings, premium furnishings and a beautiful view of Laguna Bay and the ocean, this is a great place to spend an hour, let alone an entire holiday. Hastings Street is directly below you – with world-renowned restaurants and luxury designer boutiques just outside your front door. That is, if you ever decide to leave your amazing penthouse. We strongly encourage you to, because there’s plenty to enjoy all along Hastings Street. There is loads of room for the whole family (or some very lucky friends) with three huge bedrooms and accompanying bathrooms ensuring six people can holiday here comfortably. There’s a lot more to a Noosa luxury holiday than where you stay. Get out and about, soak up the amazing food and drink and visit the art galleries to get the full Noosa cultural experience. If you need any help organizing the holiday of a lifetime, get in touch – we’ll do what we can to ensure your Noosa luxury holiday beats all expectations.